Triplets are three babies carried in the womb during a single pregnancy. 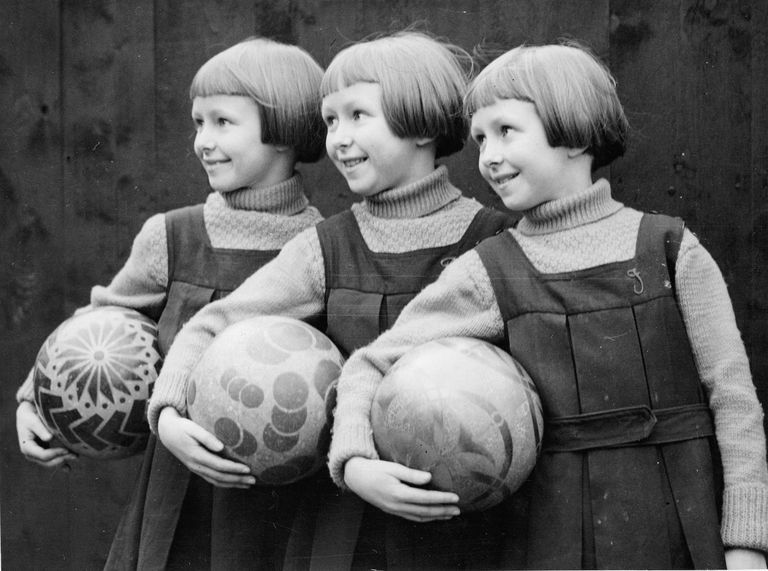 Like twins, triplets and other higher-order multiples can be categorized by their zygosity. While many people are familiar with the terms "identical" and "fraternal" in describing multiples, and use these terms to define whether twins or triplets look similar, what they are really referring to is how the multiples form. Most triplets are trizygotic, meaning that each individual forms from a separate zygote, or egg/sperm combination. They are commonly described as "fraternal" multiples and share the same genetic similarities as any siblings. However, it is not uncommon for triplets to be dizygotic, which occurs when two eggs are fertilized by sperm, and one of the fertilized eggs splits into two. Essentially, two of the triplets are monozygotic (identical) twins, sharing the same general DNA characteristics, while the third multiple was produced by a different egg/sperm combination and has a unique genetic makeup from the other two triplets. It is rare for triplets to be completely monozygotic, meaning that all three children formed from a single egg that split three ways or splits into two and then one of the two splits again, ultimately resulting in three embryos with the same general DNA characteristics. Monozygotic triplets are always of the same gender, either all boys or all girls. Some monozygotic triplets are actually quadruplets where one embryo has vanished or been reabsorbed. Because of the rarity, identical triplets often make headlines, for example when a monozygotic triplet pregnancy resulted after a single embryo was implanted in an in-vitro procedure. Allison Penn gave birth to Logan, Eli, and Collin in March 2008. Her doctors identified the situation as the only known case of a single embryo transfer resulting in triplets. Research varies on the instances of monozygotic triplets. A 2012 case report of a healthy set of three identical triplet boys conceived spontaneously lists the incidence at 1 in 100,000 live births, with most of the reported cases conceived through assisted reproductive techniques. That paper noted that only seven other cases were known that were spontaneously conceived. A 2015 paper notes the rate of incidence of identical triplets is 100 times more frequent with assisted reproductive techniques than spontaneous conception but is still extremely rare. Meanwhile, estimates seen in popular media range from between 1 in 60,000 and 1 in 200 million. This may be due to some numbers reflecting the rate of conceptions/pregnancies rather than with live triplet births. Gandham S, Ogueh O. Spontaneous Monochorionic Triplet Pregnancy With No Fetal Anomaly or Feto-Fetal Transfusion. BMJ Case Reports. 2012;2012(nov22 2). doi:10.1136/bcr-2012-007114. Gurunath S, Makam A, Vinekar S, Biliangady R. Monochorionic Triamniotic Triplets Following Conventional in Vitro Fertilization and Blastocyst Transfer. Journal of Human Reproductive Sciences. 2015;8(1):54. doi:10.4103/0974-1208.153131.